"Climate Hope City" built in Minecraft. Courtesy BlockWorks. Since it burst onto the gaming scene in 2009, Minecraft has become one of the world’s most popular video games—so much so that Microsoft bought the game and its parent company for a whopping $2.5 billion in 2014. Today, the world-building platform has also garnered the attention of architects and designers. Could a video game actually change the way architecture is taught and practiced? For those who aren’t familiar with the architectural game (or who don’t have school-age children), Minecraft allows users to build houses, cities, underground bunkers, and whole virtual worlds using 3D textured cubes that represent different materials. The crude, cubist platform creates a pixelated landscape that looks like a rustic version of a LEGO set. 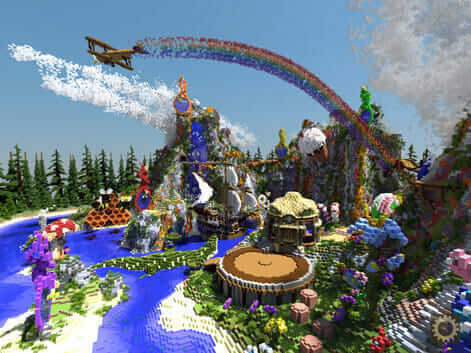 In addition to their own free-form fantasy worlds, Minecraft users have replicated nearly every famous building in existence, including the Taj Mahal, the White House, and the Burj Khalifa. 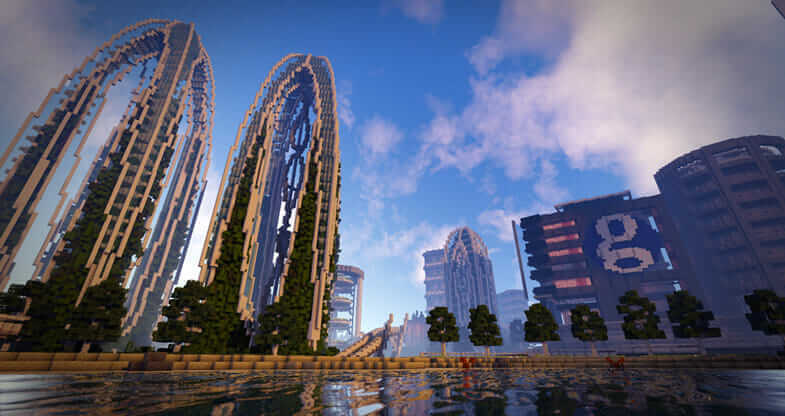 Asked by the Guardian newspaper “to build a modern vision of urban living in a clean and sustainable city in Minecraft,” BlockWorks created Climate Hope City using existing green technologies and prototypes for a sustainable design that is also achievable. Courtesy BlockWorks. 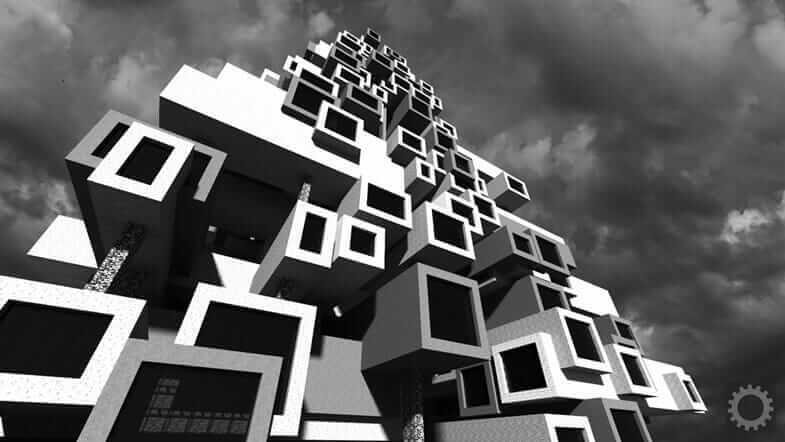 Designers have taken notice of the phenomenon of Minecraft architecture. BlockWorks, for one, is a global team of architects, animators, and other designers using Minecraft in a wide range of projects within the realms of gaming, media, and education. Directed by James Delaney, currently an architecture student at Cambridge University in the UK, BlockWorks was launched in 2013 and now has 41 builders from more than 10 countries, ranging in age from 14 to 44. 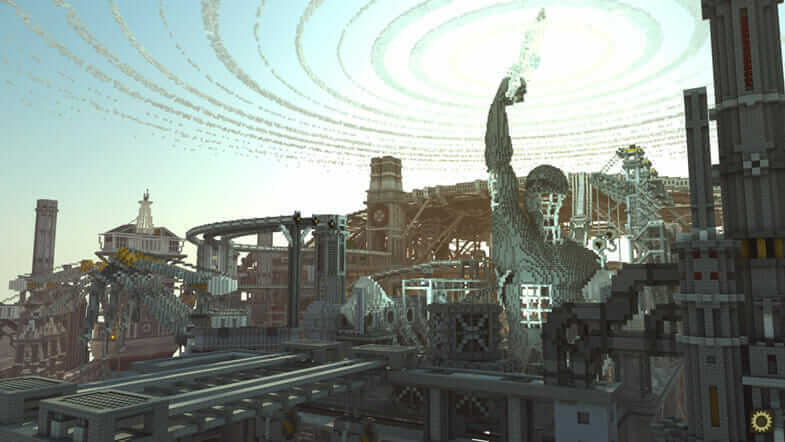 Built as an entry to the Planet Minecraft “Industrial Revolution” competition, the BlockWorks team was able to show their work process in the form of a Minecraft build. Courtesy BlockWorks. To Delaney and his colleagues, Minecraft is actually a computer-aided design tool. He believes there is an ease with which people can begin building in this platform (counting kindergartners among its users). It helps that Minecraft designers operate from what Delaney calls its “human perspective,” building as they move through and inhabit a space. The emphasis on and capability for real-time collaboration are also critical elements, Delaney says. Online sharing is a hallmark of the millennial generation and reminiscent of current architectural tools such as Building Information Modeling (BIM), which allows designers, clients, and end users to exchange performance information to a much finer degree than ever before. 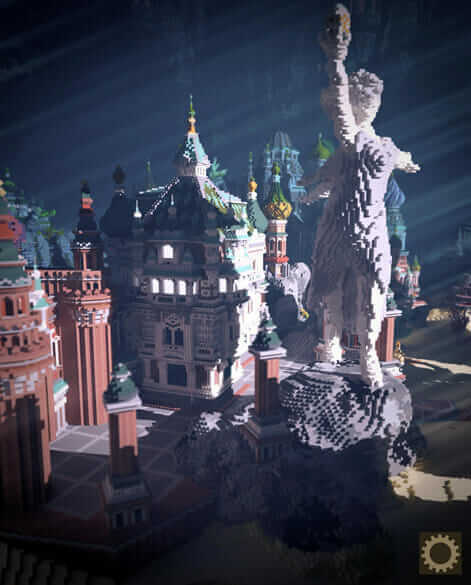 Built for the Planet Minecraft “Underwater Wonderland Contest,” the Faberzhe Palace blends fantasy and Slavic architectural styles. Courtesy Rowan Van Tuijl and BlockWorks. Among other projects, BlockWorks’ portfolio includes a re-creation of classicist Andrea Palladio’s famous Villa Rotonda, built in association with the Royal Institution of British Architects (RIBA), along with background information on Palladian concepts and floor plans of other Palladian buildings, so that other Minecraft users can try similar constructs. Produced in collaboration with the Royal Institute of British Architects, this Minecraft project coincided with a RIBA exhibit. Its goal was to engage a younger audience with Brutalist architecture. Courtesy BlockWorks. 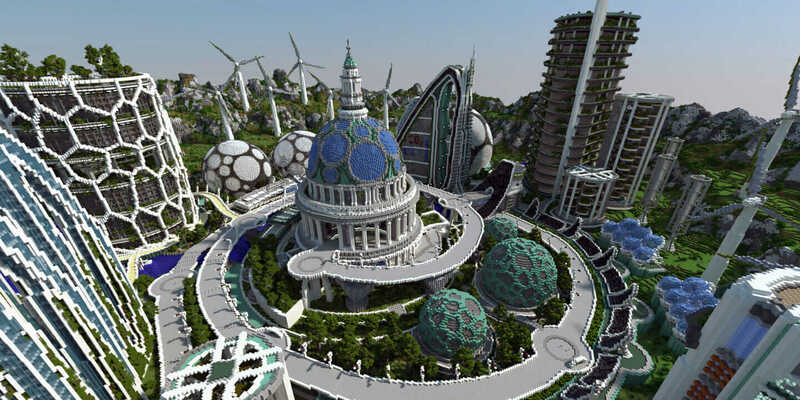 Another project, sponsored by the Guardian newspaper, asked the team to build a virtual city that used existing tools and technologies to create the most sustainable urban environment possible. This “city” is curving and organic, with wind farms and a structure based on London’s St. Paul’s Cathedral, whose classic dome is actually vegetated—a “biodome” that marries past, present, and future. Last summer, for RIBA’s Day of Play event, BlockWorks set up a Brutalist Build workshop and competition, in which young players could bring their own laptops and connect to the RIBA Minecraft server, where they were assigned a plot and asked to create a Brutalist-inspired building. About 120 young people participated, ranging in age from 12 to mid-20s and representing 22 countries. A Neverland-themed build. Courtesy BlockWorks. Minecraft and architecture are catching on as an educational tool elsewhere, too. The Chicago Architectural Foundation has offered Minecraft summer camps for students from age 7 through 18, and Zaniac, an after-school education center in Utah, has offered Minecraft architecture classes, as well. MinecraftEdu is an officially sanctioned version of the game that is specifically designed for classroom use and adaptability by teachers. Lesson plans cover everything from math and history to art; coding; and, yes, architecture.